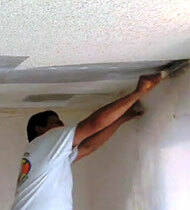 We specialize in the removal of what is commonally called popcorn or cottage cheese ceilings. They date your home and have health considerations as well as reduce its value upon resale. When We come in Quality Interiors preps your home air tight. Then we spray (water) the affected areas to moisten the popcorn and then scrap it off leaving the unvarnished drywall and ready for the next step in beautifying your home. 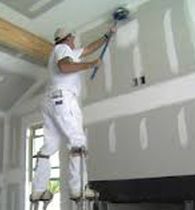 We have been in the drywall business for over 24 years and can handle any drywall job. No job is too small or too big for us. Patch and Match: patch your drywall and match it to your existing texture. Cosmetic Drywall Makeovers: Installation of custom round corners, Wooden beam encasement, fireplace makeovers to cover your brick with drywall, and custom texture for your walls and ceilings. 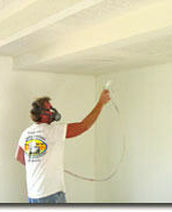 Mold and Water Damage Repair: Repair or replace your drywall that has been damaged by water or mold. 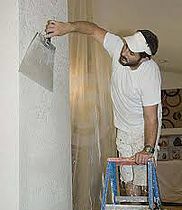 Paint: Quality paint service offered at affordable prices. Inquire when setting up your in-home.